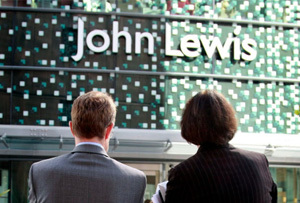 High street stalwart John Lewis posts strong profits, and staff at the employee-owned department store get a 17% bonus. John Lewis is one of the few retailers to have weathered the storm raging on Britain’s high streets, and after another strong year its 87,000 staff have netted bonuses equivalent to almost 9 weeks’ extra pay. Group profits John Lewis Partnership rose almost 16% to £409.6m, and the group’s collective bonus pot was around £210.8m, or a 17% rise for each worker – up from the 14% bonus paid out last year. The John Lewis group, which also runs upmarket supermarket Waitrose, created 3,800 net new jobs over the last year – something of an achievement as other high street retailers struggle with falling sales and weak consumer confidence. John Lewis credits the strong year to its successful online business. Taking advantage of the growing trend for internet shopping, John Lewis has been pumping money into Johnlewis.com to grab more customers, and the strategy has been paying off. The group said over 1.5 million more customers now shop with Waitrose or John Lewis than last year. Meanwhile rival M&S has had a tougher year, reporting a 1.8% drop in sales over Christmas. Has John Lewis taken the crown of the UK’s favourite posh store?